1. When Cass manages to conjure something, even she’s not sure what to make of it. Stephanie believes firmly in ghosts, yet Bee doesn’t believe in anything other-worldly. What do you think? Are ghosts real? If they are, do you believe some people have the ability to communicate with them? 2. Was there one particular character who intrigued you? Someone you’d like to learn more about or see play a bigger role in upcoming books? 3. Have you ever had a paranormal experience? 4. Have you ever visited anywhere haunted? Would you spend a night or a weekend in a supposedly haunted house? 5. If you could choose one character from the book to be friends with, who would it be? Why? 6. Beast is in desperate need of training, and he ate one very important piece of evidence. Have you ever had a dog eat something he shouldn’t have? 7. Would you attend one of Cass’s group readings? If you did, what would you hope to learn? 8. Have you ever visited a psychic? If you have, what was the experience like? If you haven’t, would you like to? 9. Are you a fan of cozy mysteries? If so, what types do you enjoy most? 10. Being stranded in the middle of a blizzard is only one down side of living on an island. Would you like to live on an island? Would you like to live in a tourist destination? What would the down sides be for you? What about the perks? 11. If Occult and Battery were made into a movie, who do you envision playing the main characters? 12. Cass loves to walk along the beach to Mystical Musings and collect beach glass, driftwood, seashells, and whatever else catches her attention, then use them to make centerpieces for her group readings. Do you enjoy doing crafts? What kind? ​1. After working the breakfast shift in a busy New York deli for many years, Gia Morelli flees New York and heads to Florida to open her own café. With everything in her life falling apart and out of control, she decides to stick with the familiarity of a breakfast menu. What is your favorite breakfast food? Do you ever enjoy eating breakfast foods for dinner? 2. Gia wrestles with feeling homesick throughout the story. She misses the hustle and bustle of New York City and has trouble getting used to the quiet in her new home. What do you prefer? Do you enjoy living close to everything in a big city, or do you prefer the quiet of a small town? Do you prefer the anonymity of living amidst a lot of people or the familiarity of neighbors who know everything about your life—the good and the bad? 3. One of the things Gia misses about New York is the change of seasons. She misses fall, when the air is clean and crisp, the leaves change colors, and the scents of apple pie and cinnamon fill the air. What is your favorite season? Do you enjoy any special seasonal traditions? 4. Unfortunately, after sinking most of her savings into her new café, Gia can’t afford to live right in town, and she ends up buying a small house on the outskirts of the Ocala National Forest. As gorgeous as her neighborhood is, it’s going to take some getting used to. Gia’s experience with wildlife is limited to pigeons, stray cats, and an occasional rat in the alley behind the deli. Moving to a place that’s home to spiders (very large spiders), snakes (poisonous ones), and even bears, when she’s already at her wit’s end, comes close to sending her over the edge. What kind of wildlife do you have to deal with where you live? Are there any critters you find particularly scary? 5. Gia never expected to get a pet, but Thor turns out to be her best friend. Do you have pets? Have you ever ended up with one you didn’t expect? 6. If you could choose one character from Boggy Creek to be friends with, who would it be? Why? 7. Was there one particular character who intrigued you? Someone you’d like to learn more about in future books? Someone you think might not be what they seem? 8. Earl is Gia’s first customer, and they become fast friends. Have you ever met someone you just hit it off with almost instantly? Someone you knew would play an important role in your life even when you first met? 9. 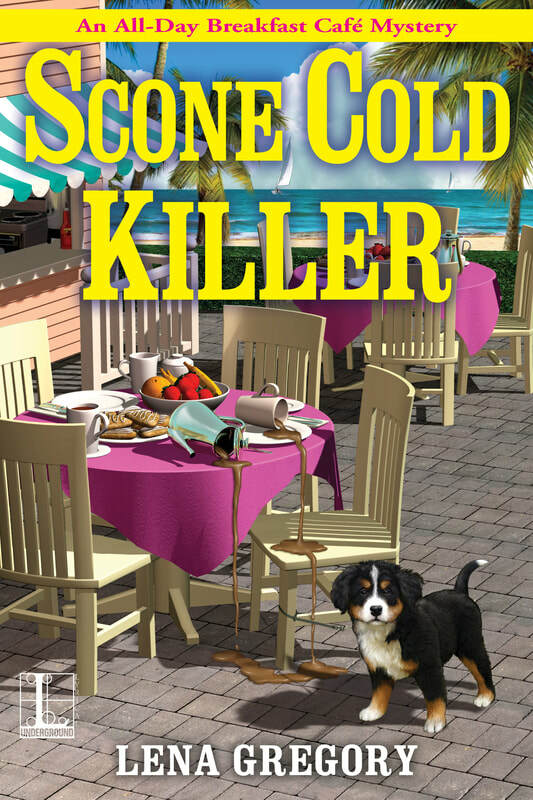 If Scone Cold Killer were made into a movie, who do you see playing the main characters? 10. Gia and Savannah are best friends. There’s very little they won’t do for each other, even if it gets them into a few sticky situations. Have you ever had a best friend like that? Someone you could share everything with and they’d always have your back? Did you ever get yourselves into a situation you might not have gotten into on your own or with anyone else? 11. Gia’s opening day doesn’t go exactly as planned, and she ends up having to spend most of the day in the kitchen in front of the grill. At least her customers seem to enjoy the food! Have you ever planned something that just went completely wrong? 12. Are you a fan of cozy mysteries? If so, what types do you enjoy most?